HomeEditor's PicksRelationshipsShe was 16 and he was a Chippendale. Was their relationship doomed from the start? She was 16 and he was a Chippendale. Was their relationship doomed from the start? As the sun shone through the window, I smiled. “Morning,” Randy whispered, kissing me. It was how he woke me up every morning. “Good morning,” I giggled, kissing him back. It was just me and him against the world, which is how it had always been. “Do you know what day it is today?” He continued, beaming. But of course I did. It was March 19th 2015 and it was our anniversary. I dozed dreaming about how we met. It was August 1992, I was 16 and as the train pulled into London, I squealed with excitement. I loved travelling from my home in Ilford, Essex to London to watch west end shows. Donning low cut jeans, a tight top and a deep fake tan I felt amazing. “I’m going to bag myself a Chippendale,” I told my sister, Lesley, then 26. Giddy with anticipation, we plonked ourselves right at the front. Minutes later, the lights went down and music boomed round the auditorium. Soon, over 20 ripped men were gyrating on stage in just collar and cuffs. Seconds went into minutes and we lost track of time as we watched men thrust in next to nothing. Lesley leaned in, “he keeps looking at you!” She pointed at the toned man hanging from set scaffolding. Weirdly, I’d been looking at him too. He was stacked with rippling muscles and kept smiling at me. Every time he came on a smile crept across my face. “He is hot!” I shouted to above the music. “I’d have them all,” Lesley replied laughing! Before I knew it, it was the finale and we were on our feet. Suddenly the guy I’d been watching started waving. I looked behind me, is he waving at me? Butterfly’s danced in my stomach and I smiled as the curtain went down. “Come on,” I told Lesley, pulling her up. We raced to the stage door and there he was – all 6ft2 of him. “Hi,” he said, peering down at me. “Did you enjoy the show,” he continued, edging closer. His frame shadowed my petite frame. “Fancy grabbing a coffee?” He asked. I kissed Lesley goodbye and excitedly waited for Randy to change. My stomach flipped. He was built like a Greek god and I was about to go out with him. Would a ten year year age gap work? An Essex girl and a Chippendale, I smirked as I waited. Suddenly the stage door opened and he looked just as good in clothes. “Right let’s go!” He said, putting his giant arm around me. As we walked to Covent Garden we didn’t stop talking. I had to take quicker steps to keep up with his strides. Randy was 26, he was the all American boy from Idaho. A football golden boy, turned professional ballet dancer, turned Chippendale. There was an age gap of 10 years, but it didn’t even enter my mind. He was so charming and respectful. “You’re beautiful,” he said. I blushed. On the way home I couldn’t stop thinking about him. We had agreed to meet the next day, he was only going to be in the UK for three months. That morning I woke up full of excitement. I rushed downstairs and into the kitchen. I looked down at the tight dress I was wearing. “I’ve got a date Dad!” I said giggling. “What! With who?” he probed. Like most dads, he’d always been protective of his little girl. Imagine his reaction if he actually knew I was meeting an American stripper 10 years older than me? The train journey into London couldn’t move fast enough. He was taking me to see the ballet and I couldn’t be more excited. I fussed with my hair as I wanted to look perfect. I’ve not been this happy in ages. As I got to Hyde Park I saw Randy standing with a red rose. “I couldn’t stop thinking about you,” he told me. He leaned in and gave me a big kiss. By the end of the day, we were smitten with each other. “I’m glad you waved at me,” I confided, as we walked out of the theatre. In that moment, I knew he was the one. Randy was in London for three months, we didn’t have long together. But not everyone was ecstatic about our relationship. I had never had a serious relationship before and the age gap was more apparent to others. “Mum! He’s only 26 and I love him!” I shouted back. I put my hand to my mouth and gasped, I loved him? As the days rolled into weeks, me and Randy grew stronger and stronger. Two weeks in, it was time for him to meet my parents. “Are you worried about the age gap?” Randy asked, as we approached my house. “No, I’m worried that you’re a Chippendale! !” I joked. Despite my parent’s initial concerns, my mum welcomed him into our home with open arms. “Lovely to meet you,” she said. My dad shook his hand firmly giving him the once over. Fortunately, they were more interested in his career than his age! “So you’re a stripper?” Dad asked, grabbing him a beer. Everyone laughed. He was a hit. Three months passed quickly. “I want to be with you forever!” Randy told me before he boarded the plane back to Idaho, America. “I do too.” I replied, tearfully. Although we were on opposites sides of the world, our love stayed strong. That Christmas Randy took me home to meet his parents. “Don’t be nervous,” he coaxed. Unfortunately despite Randy’s kind words, it wasn’t quite as smooth as we hoped. “We love each other Mom!” Randy interrupted. Over the next weeks his parents questioned our whirlwind. “They just haven’t been around us long enough,” Randy consoled me. Although I could tell his parents didn’t agree with the fast pace, they were kind to me. I stayed for two months and fell even more in love. In February, I flew back to Essex, leaving Randy behind. Thankfully we didn’t have to be apart long. Two weeks later Randy came back for me. 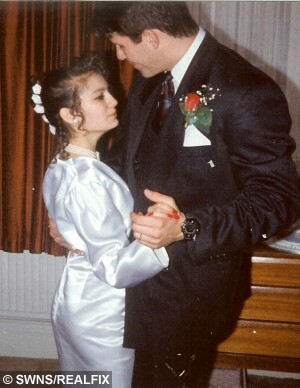 It was the 15th February 1993, we had been together six months. “It’s our half year anniversary,” He joked, as we strolled around Valentines Park. “I love you,” I smiled. “Yes!” I cried, putting my hands to my mouth. But not everyone shared our enthusiasm. “We’re worried it’s too soon,” I heard Randy’s mum say down the phone. “We’ll have a separate celebration with them,” I said, knowing they would be upset. In true whirlwind tradition we married one month later in March. “Then that’s all that matters to me,” Mum continued, giving me a big hug. Heartbreakingly, his parents couldn’t make it. It was just my family there. They told us it was because it was short notice, but I questioned if they disapproved. We married in a small ceremony in Barking church. I wore a short white dress, surrounded by friends and close family. “I hope we prove everyone wrong,” I told him. Within the space of seven months we fell in love, got engaged and married. I’m the luckiest girl in the world. In August, five months after marrying, I moved to Las Vegas, to be with him. Randy hung up his stripping days and became a waiter. I worked as an actress and we built a nice little nest. Sadly, I found out I couldn’t have children. Today, 23 years on, and we proved everyone wrong. “You’re the only stripper for me.” I told him. People often say an Essex girl and a Chippendale was a weird match. But I say it’s a match made in heaven. Next article » The sound of whipping and spanking starts a feud in the suburbs..